Officially licensed replica from The Hobbit film series. Carried by the Woodland Guard, the soldiers charged with protecting the Elvenking and northern lands of the great Woodland Realm, this Mirkwood Pole Arm was manufactured to exactly match the actual filming prop used in the motion picture series. The greenwood shaft features a 21-1/8" bronze-finished cast stainless steel blade on each end. The curved blades have a Silvan steel edge for superior strength. A wooden wall mount display plaque is included. 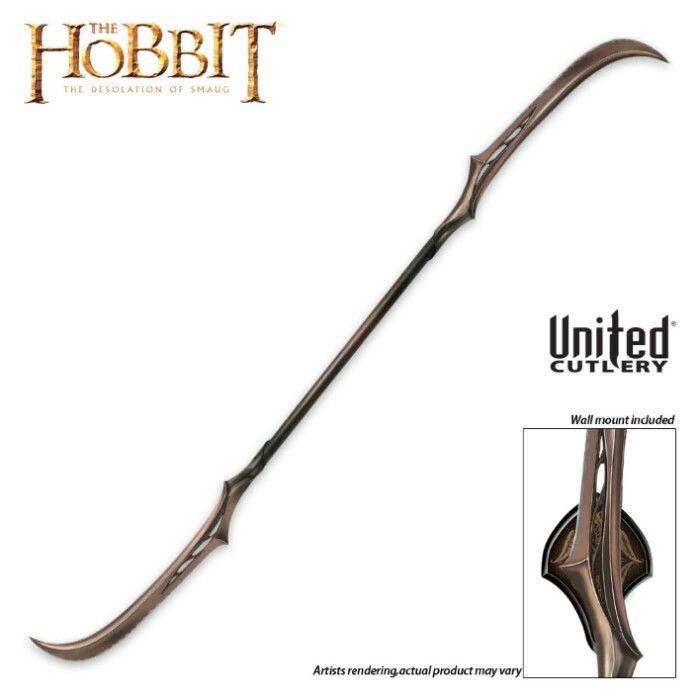 Like all Hobbit officially licensed collectibles, the Mirkwood Pole Arm includes a Certificate of Authenticity.